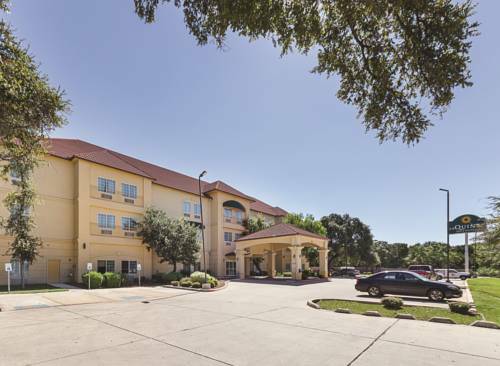 With easy access to I-10, the La Quinta Inn & Suites San Antonio The Dominion offers a warm, inviting staff and atmosphere. Within minutes of Six Flags, La Cantera Mall, The Rim Shopping Center, Sea World, The New San Antonio Aquarium, San Antonio Zoo and the San Antonio Riverwalk is just within a 15 minute drive. La Quinta Inn & Suites San Antonio The Dominion also offers high-speed Internet access throughout the hotel, meeting facilities, business center, fitness center, guest laundry, outdoor pool and free parking. Relax in our spacious, interior corridor rooms that include microwave & refrigerator, flat 32-inch LCD TV with cable, hair dryer, iron with ironing board, and more. Then enjoy a free Bright Side Breakfast each morning near the lobby. Scrambled eggs and sausage served on weekends. Hours Of Operation - 24 Hrs Direction - I - 10 East to Worzboch Rd. Hours Of Operation - 24 Hrs Direction -I - 10 East to Medical Rd.